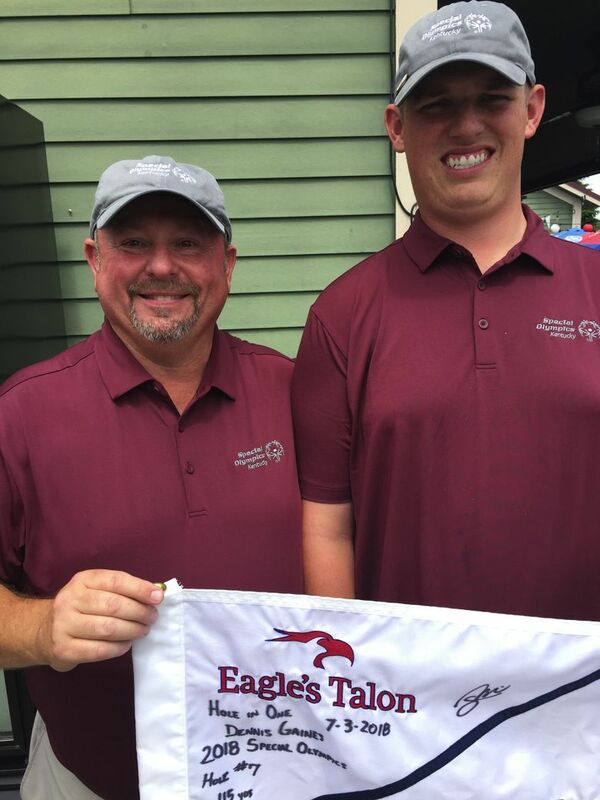 Playing as the unified partner for his stepson, John Mullins, Dennis Gaines hit the shot of his life on the golf course on Tuesday. Also, Brooks-sponsored runners, Andy and Colleen Bryant win gold. REDMOND — A day after his greatest moments on a golf course, Dennis Gaines got teary-eyed when speaking Wednesday about the shot he hit on the Eagles Talon course at Willows Run. Playing as the unified partner for stepson John Mullins in the Level 3 competition, Gaines knew the gap wedge he hit Tuesday on the 115-yard seventh hole was going to be good. The two finished third in their division with a three-round score of 258. About 20 people watched Gaines’ feat Tuesday, his first hole-in-one in 41 years of playing golf. Seattle-based runners Colleen Bryant and Andy Bryant (not related), signed with Brooks earlier this year, and this week at the USA Games, repaid the company’s faith in them when they both won gold medals in the women’s 5,000-meter run and the men’s 3,000-meter run, respectively. Colleen and Andy are believed to be the first Special Olympics athletes to ever sign sponsorship deals . The USA Games golds are career firsts for both Colleen and Andy. Andy will run the 10,000 and 4×400-meter relay on July 5. Colleen competes next in the 4×400 relay on July 5 followed by the 1500 on July 6. Seattle Times reporter Stefanie Loh contributed to this story.